An olecranon stress fracture at the tip of the elbow manifests as a cause of chronic pain just as stress fractures in other parts of the body do. Athletes who throw frequently, especially baseball pitchers, are the athletes who frequently develop olecranon stress fractures. Just like other stress fractures, they result from too much microscopic stress to a bone without enough time to rest. In pitching, this usually means too much throwing (too many times per week, too many innings, or too many consecutive seasons) without enough time for the elbow to rest. A thrower with a possible olecranon stress fracture will notice pain that develops over time, but occasionally he might notice pain after one particular pitch. The pain usually is worst just past the tip of the elbow at the top of the forearm posteriorly. Frequently the pain will only exist with pitching or just after pitching, but when it gets particularly severe, the pain can exist during activities of daily living. Pain in these throwing athletes is felt at the fracture site just past the tip pf the olecranon (orange arrow). Athletes will often complain of pain that initially goes away after they stop pitching. It starts earlier and earlier with each consecutive outing. Usually the pain goes away pretty quickly, but as the problem progresses, it takes longer and longer for the pain to disappear. 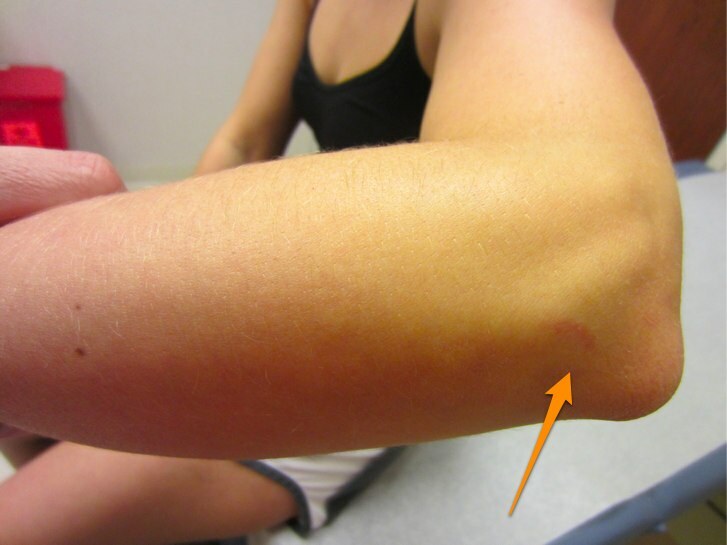 In the office, a sports medicine physician will notice tenderness to palpation at the olecranon process or proximal ulna. Occasionally pain with resisted elbow extension is noticeable, but often the exam is otherwise unremarkable. X-rays can often show the stress fracture of the olecranon process, but occasionally an MRI is needed to definitively make the diagnosis. Olecranon Stress Fractures in pitchers.